After almost two centuries of French influence in Russia, the first decades of the 20th century saw and heard the development of a visual and performance culture drawing upon the sights and sounds of native Russia. In this series we look at the collections of Sergei Shchukin and Ivan Morozov, some of the artists they collected, performances and composers of the time and the Russian avant garde. Image: The Winter Palace in Saint Petersburg, Russia. Three full working days (Mon–Fri) notice is required to qualify for a refund. All refunds attract an administration charge of 25% of the ticket price(s) with a minimum charge of $5. With subscription tickets there are no refunds for single sessions, unless a session is cancelled. Not negotiable. S. I. Shchukin bought his first Monet – a view of Belle-Ile ¬ – in 1898. He went on to collect thirteen Monets before discovering Gauguin and Cézanne, then the two most influential artists in Paris. The colour-fields of Fauvism drew on Gauguin’s example, while the Cubists extrapolated from Cezanne’s collapse of perspective. Thanks to Shchukin, young Russian Fauves and Cubo-Futurists could study both first-hand in Moscow. “Of all the wonders that the world had to offer, only art promised immortality” – Sergei Diaghilev. In the early 20th century, the impresario Diaghilev arrived in Paris with a troupe of dancers recruited from the imperial ballet of St Petersburg. The troupe, who became known as the Ballets Russes went on to conquer Paris and then the rest of Europe. The pieces that were performed were new and were set among magnificent designs by Leon Bakst and other artists. Russian composers Igor Stravinsky (1882-1971), Sergei Prokofiev (1891-1953) and Sergei Rachmaninoff (1873-43) left their homeland before or during the Russian Revolution. The impact these three inspirational composers had on musical life in both their native country, their adopted homes and the musical world in general is worthy of exploration. This talk explores the architecture of St Petersburg and the paintings in the current exhibition. We begin by referring to the classical order of the city, which is evident in its adorned buildings, including the the Winter Palace (the Hermitage). The classical tradition underscores a connection between St Petersburg and Helsinki. 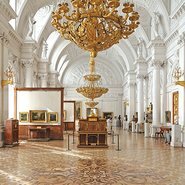 The lecture also discusses the richly embellished stair hall of the Hermitage. We then look to the twentieth century rejection of ornament in architecture. This prompts a discussion of key paintings in the exhibition, which assume the role of representing the inner significance of people and nature. The most compelling modern architectural scheme is Tatlin’s project for the Monument to the Third International (1919–20). Join AGNSW’s Curator of European Prints, Drawings and Watercolours Peter Raissis as he provides an overview of the exhibition Masters of modern art from the Hermitage from a curatorial perspective and how this exhibition documents the seismic shifts that took place in European painting in the years after 1900 and encapsulates a defining moment in art history.